About: Avera Health, based in Sioux Falls, SD, is one of the largest health systems in the Midwest with more than 300 care locations in five states, including a state-­of­-the-­art human molecular genetics laboratory, the Avera Institute for Human Genetics (AIHG). AIHG uses pharmacogenomics to analyze how the genetic makeup of an individual affects his/her response to drugs, helping clinicians efficiently identify the safest, most effective drugs for them. The Need For Improvement: Medical staff across Avera’s hundreds of hospitals and clinics shared MEDITECH’s integrated EHR, but because AIHG’s processes were not automated, clinicians had to revert to paper orders for pharmacogenomic testing, which disrupted workflow. Avera’s IT committee realized they needed to design the future‐state workflow to leverage their EHR. The improved workflow would use discrete pharmacogenomics data to drive clinical decision support and guide clinicians to the most appropriate drug options for the patient. Documentation: For patients who require comprehensive pain management, the AIHG pharmacists document their interpretation of the patient’s genetic profile and drug recommendations in a standardized note template. Ordering: Providers order pain genotyping tests using MEDITECH’s CPOE solution. Because pharmacogenomic results are now formatted as structured data, genetic lab results flow to the ordering providers’ desktops. Alerting: Clinical decision support rules created in MEDITECH’s CPOE solution flag clinicians based on the results of the patient’s pain genotyping panel. These alerts guide more appropriate medication prescribing. Patients: Minimized medication trial‐and‐error, with patients experiencing improved pain management as they transition to recovery. Clinicians: Increased physician satisfaction and productivity due to easier ordering of tests, efficient locating of results, and active clinical support that guides better decision making. A comprehensive “picture” of the patient is accessible system-wide in the EHR. Health system: New processes ensure optimal pain management and alleviate safety concerns related to ADEs. 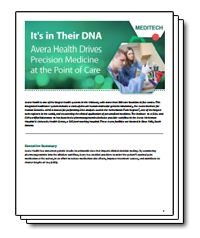 As Avera Health implements MEDITECH’s Expanse EHR, they continue to build on their success with actionable pharmacogenomic data and clinical decision support, which are crucial to improving quality of care. Download our full case study to learn more.